IT is an old story, a theme too worn for the turning of sentences, and yet too living a moral not to find every day a new point and to break a fresh heart, that our lives are wasted in the pursuit of the impalpable, the search for the impossible and the unmeaning. Neither today nor yesterday, but throughout the whole life of the race, the complaint has gone forth that all is vanity; that the ends for which we live and we die are “mere ideas,” illusions begotten on the brain by the wish of the heart — poor phrases that stir the blood, until experience or reflection for a little, and death for all time, bring with it disenchantment and quiet. Duty for duty’s sake, life for an end beyond sense, honor, and beauty, and love for the invisible — all these are first felt, and then seen to be dream and shadow and unreal vision. And our cry and our desire is for something that will satisfy us, something that we know and do not only think, something that is real and solid, that we can lay hold of and be sure of and that will not change in our hands. Last year, around this time, I was writing here about Emerson’s essay on Montaigne. I got distracted from that and moved on to other things. But I am going to get back to it now. Look for more posts in the coming days. In the meantime, you might want to look at the initial post I wrote last year. A fresh-ish start on a difficult topic. Bear with me. I take vanity to be the central concept of Montaigne’s writing: it is the concept that joins his Christianity to his skepticism, in fact it is the concept that makes his skepticism Christian. I suppose this claim might be a stumbling block for many, and for a variety of reasons. The one I want to address now is this: “You take the Essays (particularly the Third Book) as deeply colored by Ecclesiastes. 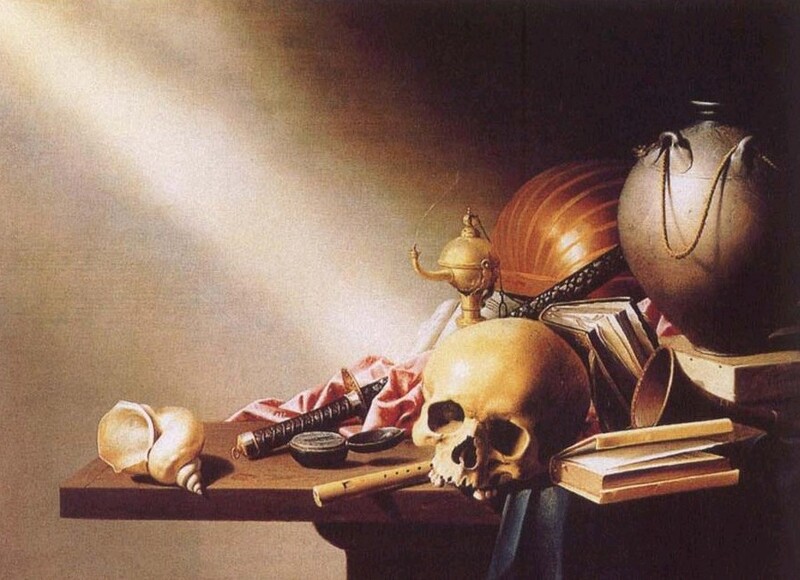 For you, the line, “Per omnia vanitas” is the running heading of the Essays. But Ecclesiastes is, remember, a description of life “under the sun”–uncompromising, cold, objective, human–a description of a world without God. So how can Montaigne’s Ecclesiastes-saturated essays be a form of Christian, again: Christian, skepticism?” But that is not how I understand Ecclesiastes. Ecclesiastes I understand as itself revelation: What is shows us is human life as revealed by God. What it shows us is not something we can lift ourselves out of by coming to faith in God, as if faith in God undid the vanity of human life. It doesn’t. God is Mystery; faith is Mystery; and the relationship of both to the vanity of human life is Mystery. That does not mean that we know nothing about God, faith or the relationship of human life to each or both, but it does mean that we cannot make simple, formulaic comments about it. (It is not safe to say, for instance, that the view of human life in Ecclesiastes is one that simply requires the supplementation of grace in order for it to undo its vanity. There’s something right about that, sure; but it is not a matter of simple supplementation.) Human life is vanity. God and faith in God do not change that straightforwardly, although God and faith in God allow for hope and patience in the vanity of human life. For Montaigne, as for the Church-Man, knowledge is vain. We should seek it, cannot, in one sense, help but seek it: “There is no desire more natural than the desire for knowledge.” But even when we have it, each of us must ask: “What do I know?…I am an investigator without knowledge.” –No matter what we do, we are all unprofitable servants. –We know what we know, but knowing it does not eliminate our emptiness or neediness, as we expect it to do. Nothing we can know can change what we are, make us new and different and better creatures. More often than not, what we know turns out to be an encumbrance, a burden, a curse; knowing what we know makes us worse. (The Serpent’s lesson, taught in the Garden.) At best, it tends to puff us up. Puffiness is Montaigne’s aversion. A Philosophy of Considered Experience? Can a philosophy be grounded on the considered experience of its author? –So grounded, we could understand it as open to analysis and to disagreement, but not as straightforwardly vulnerable to argument based on general principle. I ask because it strikes me that many of the philosophies I care most about can be understood as grounded in this way, as grounded in their author’s considered experience. Montaigne’s, of course; but Cavell’s too, of course. Many philosophers who turn in the direction of ’empiricism’, ‘experience’–can I think be best understood as appealing to his or her own considered experience. They are not best understood as appealing to experience (full stop), are not worried about (or much worried about) theorizing the rational or a-rational bearing of experience (full stop) on belief or knowledge. They are neither rationalists nor empiricists, although stretches of their philosophical terms, constructive or critical, sound empiricistic. A give-away for the sort of philosophy with which I am concerned is a moment at which the philosopher talks of experience as something to which we can be loyal, something to which we can rally, something that can obligate us, something that can be educated. Another give-away is talk about experience as accumulating, as having weight.